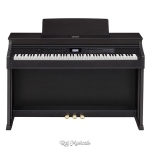 The new AP-650’s traditional design houses new stereo grand piano sounds and a “Ebony and Ivory textured keys.” Utilizing a new tri-sensor spring-less 88 note scaled hammer action, every nuance and detail of your performance is captured. A new 4 layer stereo grand piano sound delivers a natural, expressive and dynamic piano experience. RAJ MUSIALS IS AN AUTHORIZED DEALER OF CASIO PRODUCTS.